generator, but rather reflected its purpose while typically following VERMONA’s Eurorack module naming scheme. and decay phases switchable between operating with a LIN (linear) or EXP (exponential) response SHAPE — and can be used individually or in any combination. 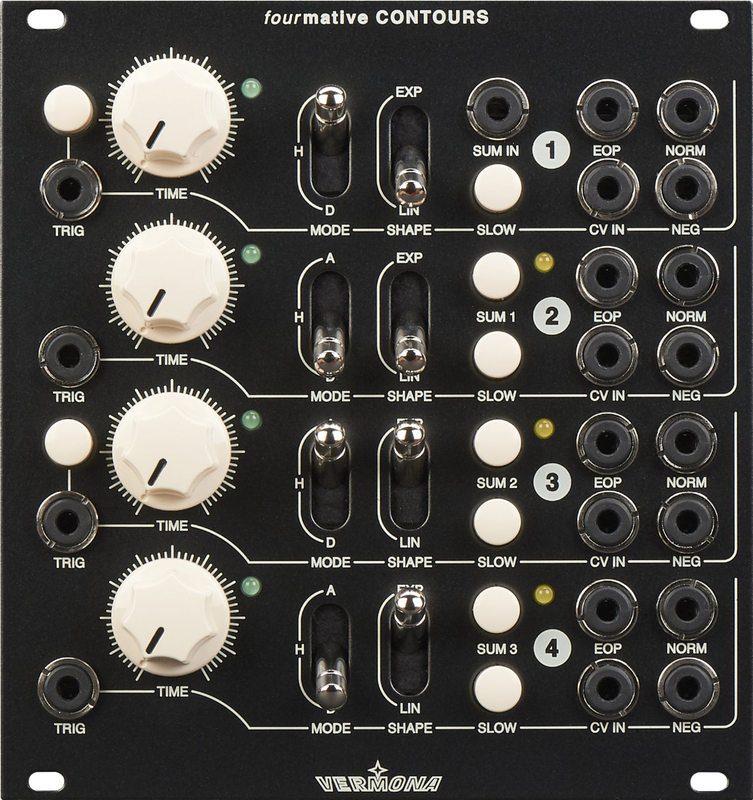 Those tasty features alone are enough to set fourMative CONTOURS apart from the Eurorack envelope generator pack, putting it in prime position for handling many modulation tasks. On the face of it, fourMative CONTOURS clearly goes far beyond the capabilities of standard envelope generators, and anyone looking for a versatile modulation source should surely consider giving it a try. The creators themselves are quietly confident that there are many more scenarios where fourMative CONTOURS can be pressed into play, filling in some equally exotic Eurorack smallformat modular system blanks, so-to-speak — not just the 24HP/3U rack space the module itself obviously occupies!